Pulverization takes place in the central chamber of the Micron-Master® jet energy mill as the process material is driven at near sonic velocity around the perimeter of the toroidal chamber by multiple jets of air or steam. No grinding media is involved. Size reduction is the result of the high-velocity collisions between particles of the process material itself. 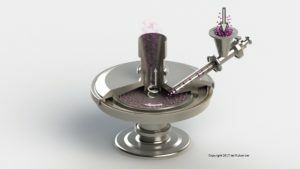 The interior of the chamber is designed to allow recirculation of over-sized particles, enhancing the incidence and the effect of these collisions. As particles are reduced in size and progressively lose mass, they naturally migrate toward the central discharge port, making precise classification both automatic and precisely controllable. The process involves no moving parts or screens and is suitable for virtually any friable or crystalline materials, even materials that are very abrasive. And, since contamination can be avoided and no excess heat is produced, Micron-Master® jet pulverizers are suitable for materials that must remain ultra-pure and those that are heat sensitive. Even cryogenic applications can be accommodated. Further, by precise metering of the product input and air or steam velocity, highly predictable and repeatable graduation and classification of the finished particles is possible. Micron-Master® mills are available in five different chamber designs and eleven sizes in order to meet the needs of a very wide range of application requirements. They provide finished product in the size range of 0.5 to 44 microns with highly predictable and repeatable graduation and classification in laboratory, pilot-scale and production applications. Micron-Master® mills are designed and built for easy installation and continuous, trouble-free operation, providing processing results that are consistently uniform. Abrasive wear or erosion is typically slight and is limited to parts that are designed to be accessed and replaced, quickly and easily. 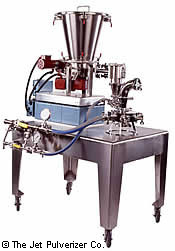 With most materials clean-out is not required but in those instances when it is necessary — in pharmaceutical or food processing for example — disassembly for cleaning or sterilization is easily accomplished. 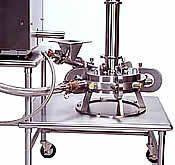 Mills in conformity with CE requirements are also available. Compared to alternative methods of size reduction, a Micron-Master® jet mill will typically provide a narrower spread of particle sizes – classification is extremely sharp and there are no large particles. In fact, the final product from a Micron-Master® jet pulverizer is comparable to products that have been run through a standard fluid-energy mill twice. Moreover, a Micron-Master® mill is 20% more energy efficient than a conventional fluid-energy design and they save even more on energy costs in that the process does not require refrigeration to remove heat, a common by-product of other mills. engineers makes this a popular option. Other clients prefer to purchase an integrated system designed and built at the Jet Pulverizer plant. This option is most common for lab systems but can be extended to pilot-scale and full production units. In some cases a lease plan or a lease / maintenance plan is more advantageous to a client. Both are available with many options provided. Jet Pulverizer engineers can also help in considering outsourcing options. And, of course, Jet Pulverizer offers an exceptional range of custom processing options at our modern New Jersey facility.